StarWars.com recently announced that Gareth Edwards (Godzilla) and Gary Whitta will be working on the first Star Wars standalone spinoff movie. The second name took me by surprise (gleefully). You see, Whitta is a former videogame journalist. He was the editor of several gaming magazines for Future US and was quite popular within the business. Since (mostly) leaving the business, Whitta has written the screenplays for The Book of Eli and After Earth. Working on a Star Wars movie will undoubtedly take his success to new heights. Welcome to Coffee Talk! Let’s start off the day by discussing whatever is on your (nerd chic) mind. Every morning I’ll kick off a discussion and I’m counting on you to participate in it. If you’re not feelin’ my topic, feel free to start a chat with your fellow readers and see where it takes you. Whether you’re talking about videogames, speculating on which player the Cleveland Cavaliers will take with the number-one pick in the 2014 NBA draft, your favorite Memorial Day barbecue food, or pregnant Mila Kunis, Coffee Talk is the place to do it. Hearing about Whitta’s Star Wars news reminded me of Kieron Gillen. Another former videogame journalist, Gillen has written some of the best comics published in the last five years. His work on AvX: Consequences was great enough to redeem the sometimes banal Avengers vs. X-Men event. 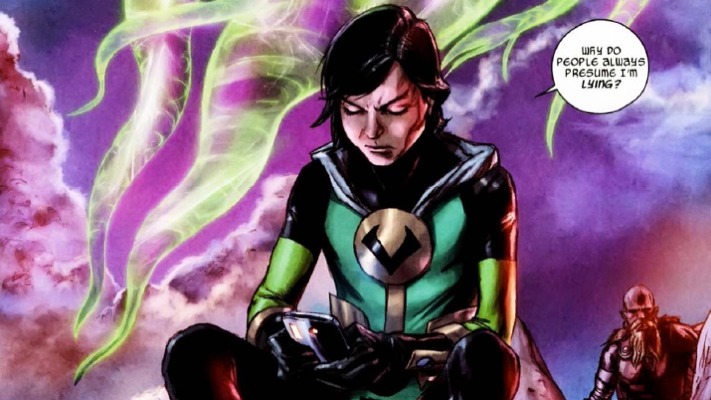 Gillen made me a Kid Loki fan for life with his thoroughly entertaining run on Journey Into Mystery. His work on Young Avengers is, in my opinion, one of the most criminally underrated books released in the last few years. Guys like Whitta and Gillen make me happy. In Whitta’s case, it’s always awesome to see a colleague succeed. In the case of both gentlemen (I’ve never met Gillen in real life), it’s particularly satisfying to see them have fantastic success beyond the videogame world. Don’t get me wrong — I love the videogame business and will always be grateful for how it has enriched my life, but I have mixed feelings about being labeled a videogame journalist (even though I’m technically a verbal entertainer). Personally, I don’t disagree with what my designer buddy told me. I never cared about “being important to the business.” I love writing about games for people that love reading about games. The problem is that there are many videogame journalists that think they’re way more important than they actually are. Some of them genuinely think that they’re movers and shakers in the industry. Those kinds of videogame journalists always bothered me; they’re more concerned about promoting their own brand and meeting the right people in game publishing in order to get a better job than serving their audience with their words. In many ways, the work of a critic is easy. We risk very little, yet enjoy a position over those who offer up their work and their selves to our judgment. We thrive on negative criticism, which is fun to write and to read. But the bitter truth we critics must face, is that in the grand scheme of things, the average piece of junk is probably more meaningful than our criticism designating it so. While I would love to work at a videogame outlet that’s primarily concerned about making fun content and staffed by a team that loves serving an audience, I can’t help but be inspired by people like Whitta and Gillen. It’s awesome that they’re enjoying tremendous success outside of the videogame realm. It’s nice to see that the boys done good.